TWO thrilling distance talents and a charismatic sprinter who hopes to become Ireland's Usain Bolt stole the limelight at an action-packed Woodies DIY Irish Schools Athletics Championships. Rising Co Down star Ciara Mageean (Assumption Ballynahinch), who took 800m silver at the World Youth Championships last year, certainly didn't disappoint on her schools swansong. 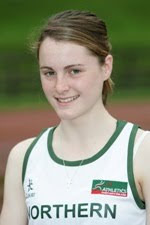 The defending 800m/1500m champion knocked 11 seconds off Sinead Delahunty's senior 1500m record, coming home 30 seconds clear of the field in 4:19.00, just 48 hours before sitting her first A-level. Mageean still hasn't decided what she's doing next year but said she is "seriously contemplating taking a gap year", especially as she's racing in the World Junior Championships this summer and also hopes to run in the Commonwealth Games in October.